No not the time of season, a chick. When his girlfriend, Summer (Zooey Deschanel), unceremoniously dumps him, greeting-card copywriter and hopeless romantic Tom (Joseph Gordon-Levitt) begins sifting through the year-plus worth of days they spent together, looking for clues to what went awry. As he recalls the good and bad times he spent with the commitment-phobic girl, his heart reawakens to what it cherishes most. This is surely one of the best romantic comedy’s, if you would like to call it, that I have seen all year. I was totally suprised by this film and its deliverance of the story. 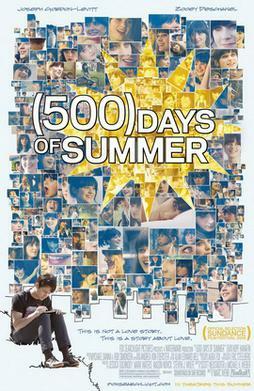 I expected this film to be showing the days of their relationship from day 1 to day 500, but instead you get a totally original way of showing these two relationships’. We go from day 43 to day 3, and from day 147 to 79, and we begin to string together their relationship. The heavily inspired and originality of this film is what really got me. There are some really original moments that are both memorable but also very true and I just wish that more directors would take as many chances as director Marc Webb has. The non-linear telling of the story is not distracting one bit and falls into total order and fully gives us the ups and downs of their relationship. Many other things about this film are just so amazing but one imparticular is that this is not your regular romantic comedy that you come by. It’s true about love and life unlike many other romantic comedy’s that have come and gone and surely shows what its like when two “real” people get together. The stylized scenes are there and not very show off and through these scenes you can actually feel the sense of being in love. Chemistry between the two leads is so perfect that I actually thought I was watching a documentary on a couple. Gordon-Levitt is amazing, and sort of reminds of a John Cusack type guy who is your normal everyday dude but he’s not boring. He’s also very believable and very entertaining to watch and I caught myself loving this guy throughout the whole movie. Deschanel is also very good playing the character she always plays but this one adds a little twist and you like this one a lot more than anyone she’s ever played. The feelings I felt during this film I cannot explain. I never have come around a film in my life that has made me feel so happy and mesmerized about my life and this film, and overall it was a very touching experience. Consensus: This film is so original with great chemistry, true screenplay, real-life people, very fresh soundtrack, and overall a very different but touching unconventional love story that I loved from beginning to end.